A commercial license is permanent and grants you free updates and free tech support for the period of validity of the update plan purchased. When your update plan expires, you will be able to continue using your current license indefinitely, but you will not be able to run any updates released after the expiration date. Renewals of the update plan are available at a very convenient price. Integrated Upgrader. In HighDesign 2017, use the Activate HighDesign panel to enter name and key for your current license. Once the key is validated, you will be redirected to the Upgrade store. See this page for detailed information. Email Request. Alternatively, if for any reason you cannot use the integrated upgrader, enter username, license key and your email in the form below. If the license is eligible for the upgrade, you will receive the link to the Upgrade store via email. Wire transfer is a method of electronic funds transfer from one person or institution (entity) to another. A wire transfer can be made from one bank account to another bank account. If inside the EU, VAT ID if available. You will then receive an email from us with the info to proceed with the payment and complete the purchase. Orders are processed as soon as we receive the email notification. The license key is then emailed to the address provided in the order. Usually that takes from a few minutes to no more than a few hours. If after a day you still can't find the email with the activation key, please check your junk mail folder for incoming messages from ilexsoft.com that might have been mistakenly filtered. For any requests, send an email to sales@ilexsoft.com. When our products are downloaded from the Ilexsoft site, they come with a 30-day trial period. We want to ensure our software fit your needs, so we recommend you try our products before you buy. We offer a 30-day return option on all our products purchased from this website. If you wish to return a product, just contact sales@ilexsoft.com to request a refund. 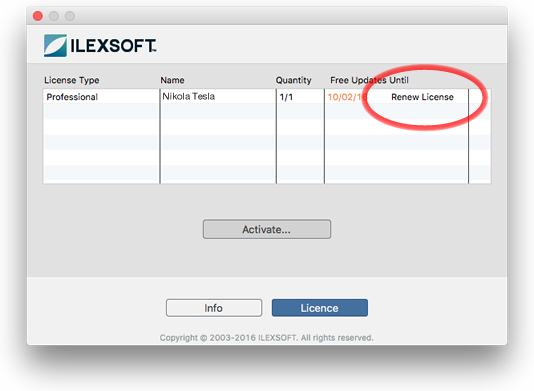 If you have previously purchased software licenses from us and have since misplaced your licenses, you can re-request them by entering the email address to which your licenses are registered (the email address you used for the original order or when you registered a retail purchase, unless you have since had us update our records). Any licenses registered to the email address you specify will be emailed to that address.